Description: Smart presenters and meeting organizers are integrating experiential learning and peer connection into their events. This book tells you how to do it. Buy The Power of Participation to learn why it’s so important to incorporate participant action into every aspect of your event, what you need to know to create a meeting environment that supports and encourages participation, and when and how to use this extensive compendium of specific, detailed techniques to radically improve your sessions and meetings. 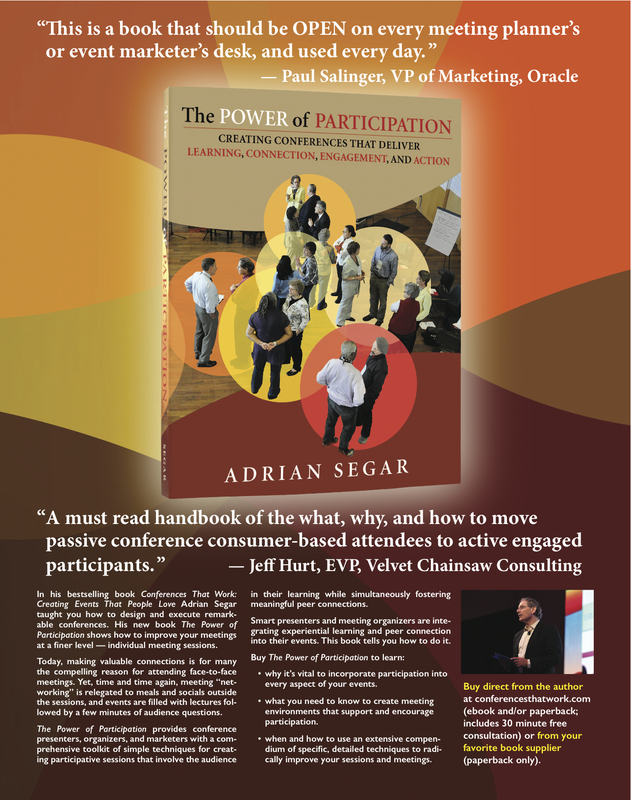 Please take a few minutes to post a review of The Power of Participation on Amazon. Good reviews really help! You can purchase The Power of Participation directly from this site (discounted prices plus a 30 minute free consult for first-time buyers). To obtain paperback books outside the U.S., use the links above or search Bookfinder (Conferences That Work) and (The Power of Participation) for local outlets. The ebook and paperback/ebook combo are available only directly from the author. Fantastic!…One of the first books that really talks about design aspects in a whole new way.